Posted on December 16, 2018 by MD Posted in Uncategorized, United Kingdom . Students and staff at the Wyvern School took part in the Peace Field fundraising cycle and rowing event during the week of 25th to 29th March, to help raise funds as part of the school link to the Peace Fields project which enables children from underprivileged backgrounds of mixed ability and mixed gender to take part in the 2019 GLOBAL PEACE GAMES, an opportunity to participate in a weeklong peace education programme at The Peace Village, Mesen, Belgium that will have a lasting impact on each and every young person. Pending funding there is an opportunity for students from Wyvern to participate in the 2020 games. The activity involved the whole school were students were able to either ride two-wheel or three-wheel bikes, scooters and an adapted wheelchair bike around measured tracks located about the school playgrounds, and a static cycle, or row on a static rowing machine (to cover the distance across the channel) to equal the same distance members of the National Children’s Football Alliance cycled from Canterbury to Ypres on their sponsored bike ride. Members of Wyvern covered a total distance of 107 miles, just over the actual distance required, raising £200, a fantastic achievement. 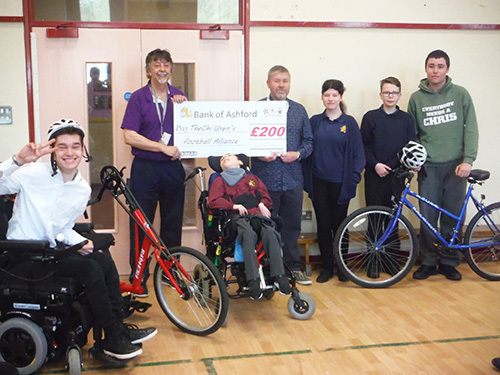 The cheque was presented to David Ramzan, NCFA Disability Officer, by the students of the school and headteacher John Somers. Thank you so much for organising such a memorable and wonderful visit for the boys- and us! It was an amazing, moving and truly inspiring visit. Bruges were so welcoming and friendly – I was honestly taken aback by their generosity. It’ll be a trip all the boys will remember forever I’m sure. Many many thanks for making it happen. Five students from the 6th Form have just returned from a successful residential visit to Belgium. 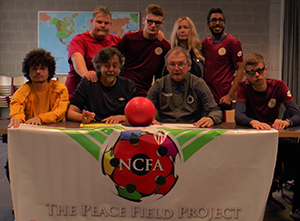 Wyvern school has signed up to a Peace Field Project organised by the National Children’s Football Alliance – in fact we are the first SEN school in this country to have joined. Its purpose is to commemorate WW1 and the centenary and to celebrate peace by giving schools the opportunity to twin a designated area of their playing field with Flanders Peace Fields, the site of the Christmas Truce. In the week leading up to Christmas 1914, groups of German, British and allied soldiers stopped fighting to sing festive songs. Some soldiers on Christmas Eve and Christmas Day ventured in to “No man’s land” to exchange gifts and to play games of football. Students shared a room at the Peace Field Hostel and, over the course of a couple of days, were given guided tours of a number of Commonwealth War Memorials and trenches by Ernie Brennan, a representative from the Children’s Football Alliance. They also attended the Last Post, a nightly service that has been conducted at Menin Gate every night, 365 nights a year since the end of WW1. On the first full day at Messines, students signed a football and placed it at the site of the Christmas Truces. They were shown how close the British and German trenches were and they visited the field where the Truce took place, now marked by just a simple cross. 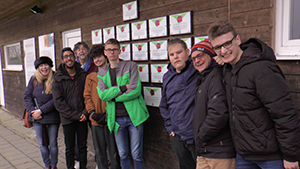 Later that day, students unveiled the Wyvern School plaque at a Peace Field football pitch, twinning us forever with that site. On the final morning, Wyvern school played Bruges SEN team. Both teams swapped presents at the start of the match, just as the soldiers in 1914 had. Wyvern gave Bruges a signed school shirt and they gave us their club flags. Philippe, the Bruges coach, presented us each a small clay sculpture. In total there were 600, 000 sculptures commissioned, one for each person – civilian or soldier – who died in Belgium between 1914-18. The opposing team were a couple of years younger, and, without being asked, our students showed a real and intuitive generosity of spirit by playing kindly and shouting words of encouragement to the opposing side. It was still a competitive game, with the younger team being completely unafraid of the older boys, and tackling with determination. The final score was 9-8 to Wyvern. We sang, or at least attempted to sing, ‘Silent Night’ in four different languages and finally our students signed another football which was placed at a memorial at the hostel. David Ramzan and Philippe signed a Peace Declaration and we have pledged, in the near future, to play a game of football on our school site in the spirit of friendship and humanity of the original truce. The students were wonderful ambassadors for the school and David, Darren and I couldn’t have been prouder. 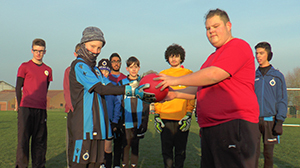 Pupils and staff from The Wyvern School, Ashford, Kent, UK unveiled their Peace Plague at Flanders Peace Pitch. They also visited the site of the Christmas Truces to commemorate the war dead and celebrate peace. They also visited The Last Post, The Menin Gate, Ypres. The team celebrated twinning their school’s Peace Pitch with The Peace Village, Peace Pitch, Flanders by playing Bruges FC. The Wyvern School v Bruges FC Saturday 15th December will officially twin the school’s football pitch with Flanders Peace Field. The ceremony will take place at the Flanders Peace Pitch and The Peace Fields Project Plaque will be unveiled by Helen Newman (The Wyvern School) and Matti Vandemeale (Director, The Peace Village). The Declaration of Peace will be signed by David Ramzan (NCFA, Special Educational Needs Officer). The Wyvern School, Ashford, Kent, is a special school for children with severe, profound and complex needs that caters for learners from 3-19. Dedicated staff work closely with parents, carers and multi-agencies to ensure that all children feel safe, secure and supported in their learning. Each child will have a unique experience and our aim is that they enjoy their learning and realise their full potential. 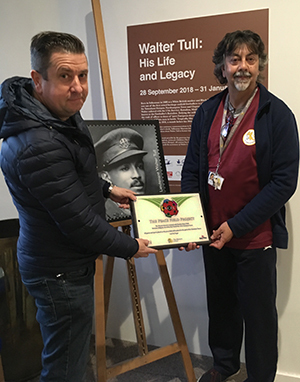 Ernie Brennan, National Children’s Football Alliance, CEO, presents David Ramzan, NCFA, Special Education Needs Officer and The Wyvern School, Ashford, Kent, Teacher Assistant, a Peace Field Project (PFP) plaque at Folkestone Museums’s Walter Tull exhibition. The PFP officially twins the school’s designated area of play with Flanders Peace Field.